What would the world be like if women were safe? What would a tech campus be like with internet speeds of 100 Gigabits per second? The answers to these questions may be more connected than expected, and both may be found in San Leandro. 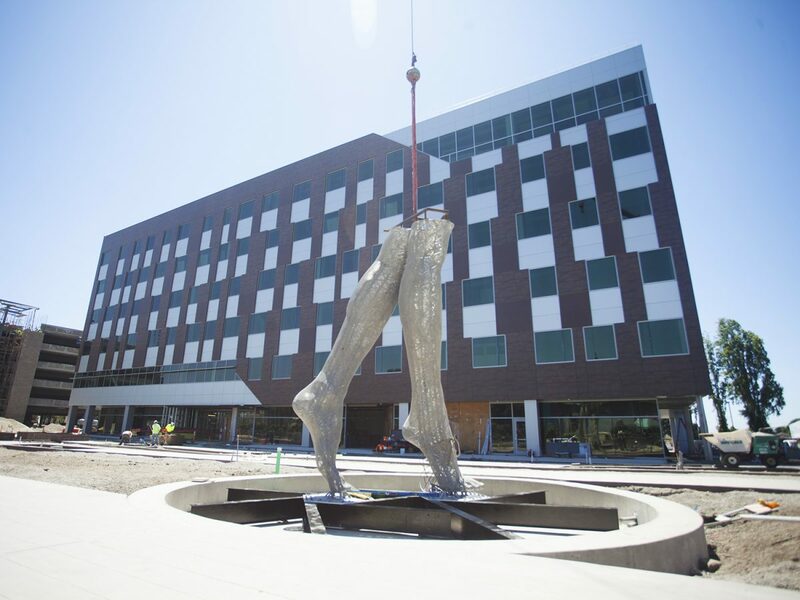 The 8,000lb legs and structural base of Marco Cochrane’s “Truth Is Beauty” sculpture was recently installed at the RMW designed San Leandro Tech Campus. The 55ft confident female figure, intended to signify change, maturity, and a city on the leading edge, will anchor the campus plaza. At its base, the sculpture will be surrounded by the words “What would the world be like if women were safe” inscribed in the 10 most commonly spoken languages in the Bay Area. Scheduled for opening in November of 2016, the Phase 1 building will be the first of its kind in the city, bolstering unparalleled internet speeds, and making clear that this quiet city is ready to make a statement. During the San Francisco earthquake in 1989, the Del Monte Cannery in San Leandro incurred significant damage and was later demolished, leaving the 7.5-acre property vacant for many years. Several subsequent housing studies were followed by the 2008 recession, which forced Westlake Urban developers to reexamine the purpose for their slender parcel of land between the San Leandro BART station and the Pacific Railroad tracks. Anchored by the 3-story OSIsoft building at 777 Davis St., and less than a mile from City Hall and downtown areas, 2011 market conditions spoke to the potential for an office building so Westlake Urban began the interview process for an architect. With the goal of finding the ideal tenant, Westlake Urban soon partnered with the property’s neighbor OSIsoft as coowner and tenant of the 1st building. A family owned global data mining company that has been in the community for over 30 years, its CEO and founder Dr. J Patrick Kennedy had also founded LIT San Leandro, a public-private partnership that offered a dark fiber loop to local business using 288 strand fiber cable. Dr. Kennedy understood that his neighboring companies were at the perfect location, close proximity to the airport, Port of Oakland, railway system, and BART to transport their workforce. 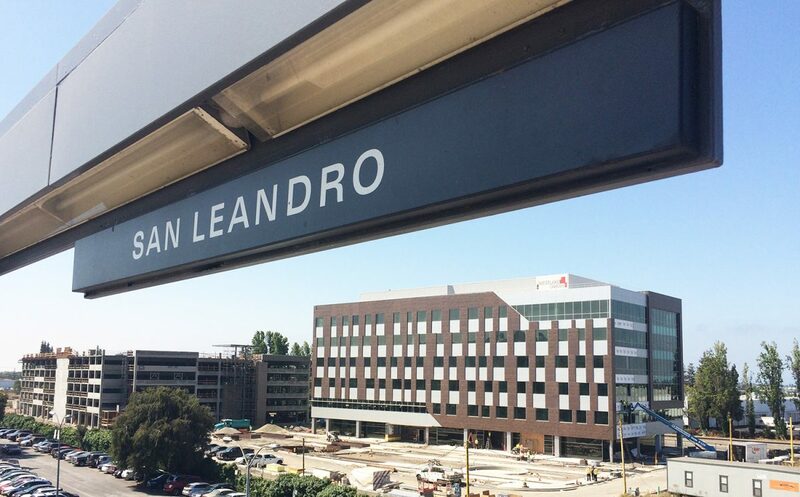 With San Leandro having its own power infrastructure, the only thing missing was technology. The synergy between these neighbors positioned the vision of the Class A San Leandro Tech Campus to become a reality and secured RMW architecture and interiors to Design 390,000-sf of office space with options of master planning up to 750,000-sf. Now the tallest building in San Leandro, the 135,000-sf hub of smart building technology is clad in View Dynamic Glass and a Neolith skin. View Dynamic Glass automatically responds to outdoor conditions and people’s preferences, or can be controlled individually from a mobile device. The largest project for this Milpitas-based company, 20,000 square feet of View Glass has been installed on the SL-TC Phase 1 building, which will not only improve the long-term interior aesthetic by eliminating the need for window shades but will assist with limiting heat gain and reduce the HVAC system loads. 26,000-sf of View Glass will be used on the Phase 2 building. Over 100 miles of cable has been used to monitor and control the window systems and within the walls above each window resides its own controller with an IP address, a true testament to the innovation ecosystem at this RMW designed Tech Campus. With significant engineering in place to manage decibel levels from Amtrak horns and BART brakes, the other external technology feature unique to the skin is the Neolith façade. Manufactured in Spain, this quarter inch thick ceramic product is overlaid onto concrete and does not fade, rust, or scratch. It has the look of Corten steel but at a fraction of the weight. Duct cleaning near me helps to enhance the efficiency of the heating/cooling system, thus reducing energy bills. Since this project started in 2011, it has evolved through numerous iterations but has consistently embraced bold approaches to innovation and technology from below ground to the roof of the parking garage. The RMW team continues to be motivated and challenged as design for the Phase 2 building is finalized, negotiation proceeds with potential tenants, and master planning continues for additional campus buildings. Today, from the windows of approaching BART trains, the 6 story Phase 1 building seems to appear out of nowhere, the legs and base of “Truth Is Beauty” stand in her new permanent home in anticipation of the completion of her structure on October 1st, the first few steps in place-making San Leandro.